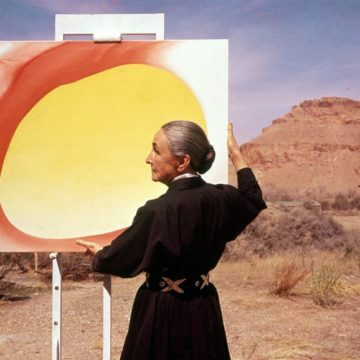 The way Georgia O’Keeffe lived her life inspires me—from her art to her clothing to her home design. O’Keeffe was born in Wisconsin in 1887. Her family then moved to Virginia. She went on to study art at various schools, but it happened to be one particular art professor at Columbia University in New York who greatly influenced her. Arthur Wesley Dow had a system of art education, based on frequent themes in Japanese art. 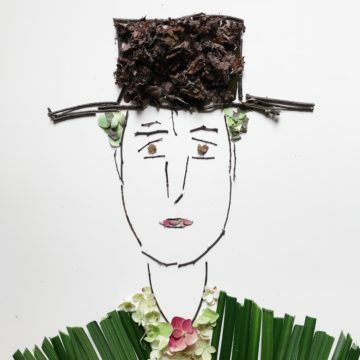 He advocated simplifying forms as a means of capturing their essence and developing a personal style. For creating art, Dow outlined three principles of successful composition: line, notan (Japanese concept of light and shade, or mass), and color. In 1915, following her time with Dow, O’Keeffe destroyed all of her previous work. While teaching at Columbia College in Columbia, South Carolina, she went back to the basics, creating charcoal drawings that led directly to experiments with total abstraction. 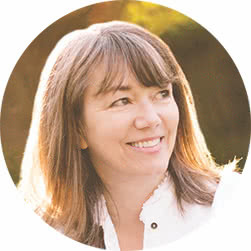 Her time studying with Dow also influenced the way she led her life. 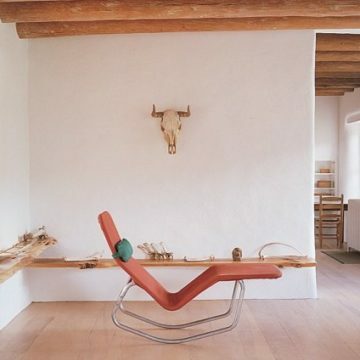 She pared her life down to the bare essentials in her two New Mexico houses, but what nice essentials they were with furniture from Charles and Ray Eames and Eero Saarinen and others. Photo: Robert Rack, Architectural Digest. 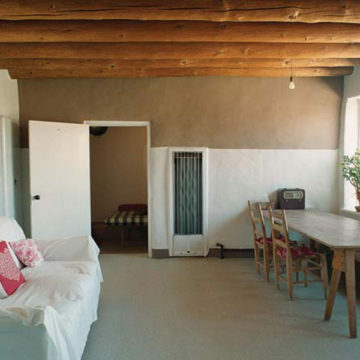 She then moved for the winter to her house in Abiquiú. 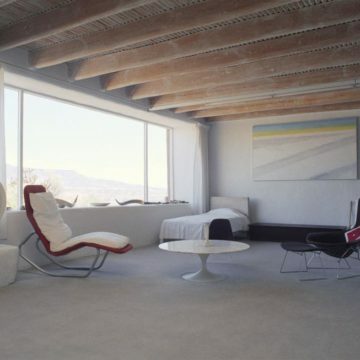 Bertoia Bird Chair on right and Saarinen Coffee Table in Georgia O’Keeffe’s studio in Abiquiú, New Mexico. Photograph by Herb Lotz, 2007. ©Georgia O’Keeffe Museum. 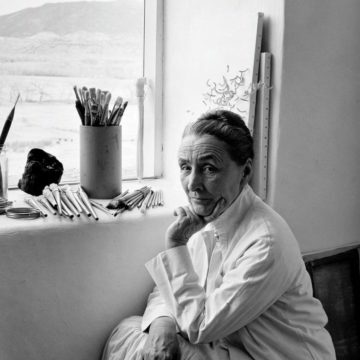 O’Keeffe intentionally kept her homes simple and open and filled with light to serve as areas for reflection and contemplation. She also wore black and white and other monochromatic colors. 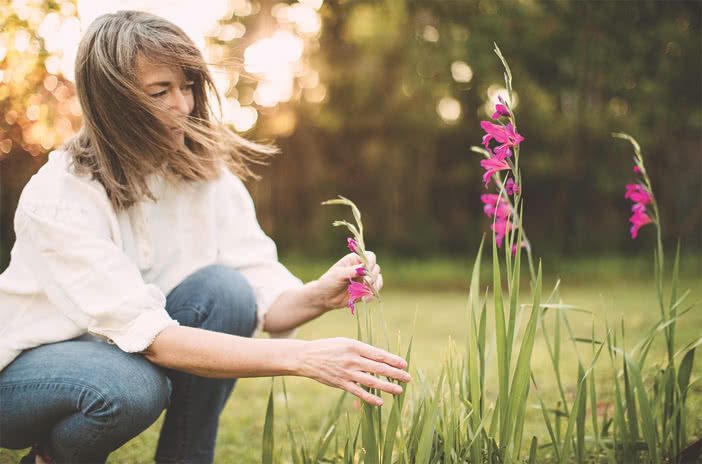 In this way, she was free to focus on her art—less decisions on what to wear or buy allowed for more mental creative space. 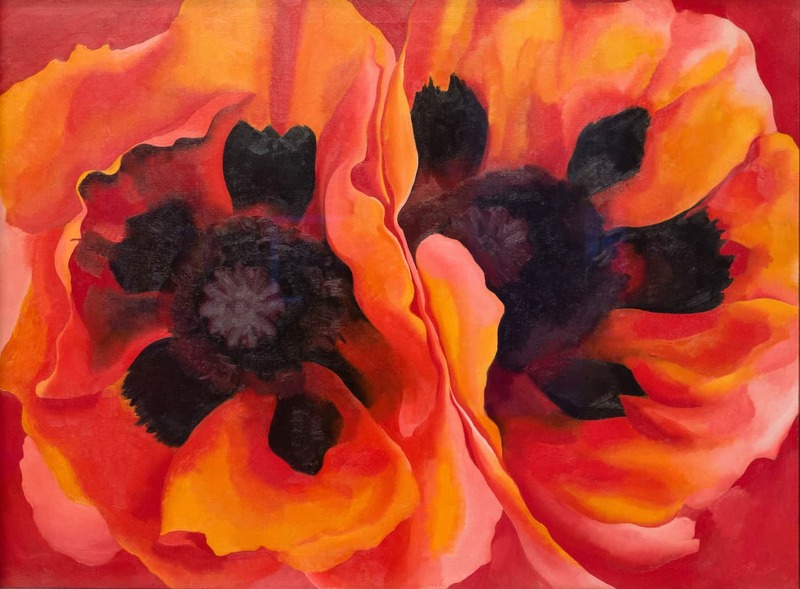 By banishing the inessential from her life, Georgia O’Keeffe kept her vision clear to create beautiful art forms such as this. What an inspiring artist and woman she was.